The young mages had split their take from the Under-City Vaults and looked to hide the undivided booty someplace in the cabal room. After thoroughly searching the chamber Gornix (played by Gil) was able to find a small alcove behind a false brick in the hearth. They stashed a bag of gems (3 diamonds, 3 sapphires, 2 jade pieces, 1 emerald, and 3 moonstones) there along with some dragon’s teeth and the lotus seeds. While they had done this they failed to notice that the amazon Athfonia (played by Perla) had slipped away just after they split the talons. The Ferenoi had absconded with her fair share of the gems and currency so the young mages simply shrugged her absence off. Concerning the gear, Excor (played by Cris) took the Platinum Key encrusted with diamonds (Level 12, Knock 3/day used by inserting and turning the key, Passdoor 1/day used by tapping the key on the door), 1 healing potion, and the Jet Amulet (Level 5, Shield at will 1/day). The Jet Amulet won in a roll-off between Cris and Jenn. Fauna (played by Jenn) took the polished bronze dagger with the carved jade grip (Level 8, +2 magic modifier, +4 to Luck level while being wielded), the mantrap seeds, the mandrake root, 1 Neutralize Poison Potion, and 1 Heal All Potion. Gornix took the Electrum Ring with black enameled runes (Level 20, Call Nature’s Ally [Eagle] 2/day) and a Heal All Potion. Excor put the heavy bronze spiked mace under his chair as nobody wanted to actually continue carrying the weapon around. Szoosha (played by Isis) took possession of the ruby-studded Copper Bracers inlaid with silver (Level 16, Armor Bane at will 1/day, +2 magic modifier to hand strikes and to bracer parry), 1 Neutralize Poison Potion, and 1 Claws of the Beast Potion. Equipped with their new gear and their purses fattened with their shares of the loot the young mages decided to accompany Gornix to his apartment since he was still carrying the Amber Bee. It was still night though the wee hours. Black storm clouds filled the sky. As the small group of mages walked through the city streets the lighting flashed and thunder cracked across the sky. They were about half-way to Gornix’s apartment when Fauna spotted the dark outlines of four winged imps following them. Excor pulled his Copper Spike and shot a lightning bolt at the lead red imp barely scratching it. 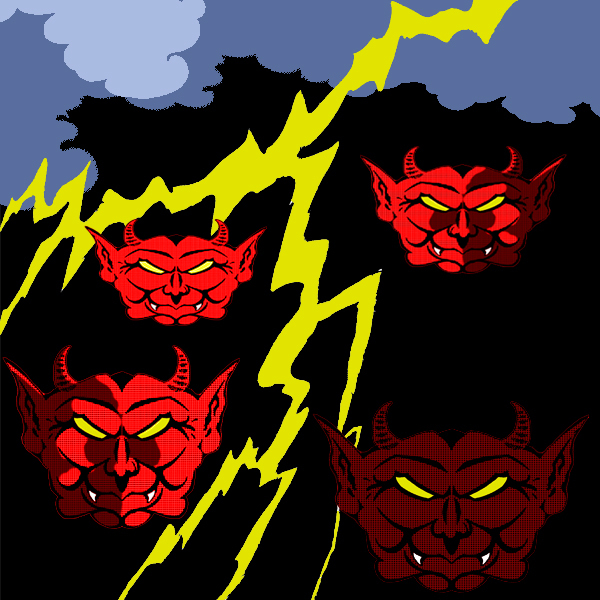 The third imp flew up to Gornix to smash its tiny split-hooves into his face as lightning flashed the sky. Fortunately he parried. The first imp exhaled a cone of fire catching both Fauna and Szoosha in the area of effect. Fauna lucked out and took no damage (Natural 20) but Szoo was badly burned and stunned by the blast (forced a Recovery roll so he didn’t die). The second red imp did the same catching Szoo and Excor in its fiery breath. Szoo dropped into unconsciousness from the burns. Excor lucked out and took no damage (Natural 20’d it as well). Fauna forced her Heal All potion down the Naga’s throat. The fourth imp blasted its fire breath at the young mages singing them all. Gornix whacked imp number three with his staff but dealt no damage. The first imp kicked Excor in the head drawing some blood. The second imp kicked Fauna in the face whom walked right into the blow while trying to avoid (she rolled a Natural 1). Fauna was stunned and bleeding from the monster’s nasty hooves, she was forced into a Recovery roll to stay on her feet. As Szoo got up imp number four kicked him in the face with a critical blow (N20) horribly injuring the black-scaled naga. Gornix unleashed Chrono-Missile at number three, twice, significantly wounding the small demon. Imp number one burst into flames (it’s Blazing Aura [fire] ability) as did number four. Szoo cast Elemental Half-Plate Armor [fire] on himself. The flames coursed over his scaly flesh and hardened into strange looking plates of a mystical nature. Excor leveled his spike at number one slightly nicking the demon with his lightning bolt. Imp number two and three ignited their blazing auras as well. Gornix blasted the third imp again with his chrono-missiles horribly wounding it. The first imp kicked at Excor’s head drawing some blood. The fourth imp tried to kick Szoo in the head but missed. Excor quickened a lightning bolt on imp number one but only slightly scratched it again. Szoo cranked back his staff, swung a mighty blow at imp number four, and nearly threw his weapon away as lightning flashed overhead. Luckily he snatched it back before it fully escaped his grip. Fauna slung a lightning bolt at number two dealing some damage to the little monster. Number two responded with a fearsome face kick but was parried easily by Fauna. Gornix again shot chrono-missiles at number three finally blasting it into oblivion. He then cast close wounds on himself. Fauna cast another lightning bolt at number two dealing some damage to it. Number four tried to fly over and kick Szoo in the head again but locked its hooves with his staff. Excor leveled his spike at number one hurting it some with an electrical bolt. Number two tried to smash Fauna in the face again but she parried. Number one tried to cast Pox on Excor but he was able to resist the curse. Gornix took some time to check his array of wizardly knowledge about the imps (his Dark Knowledge Wizard specialist class ability) shouting out to the others where the creatures’ weaknesses lay. Szoo kept the fourth imp’s tiny hooves locked with his staff. Fauna cast a lightning bolt at number two severely wounding it. Imp number four tried to break the lock with Szoo but couldn’t break loose. Number two tried to kick at Fauna but missed horribly and fell to the ground from the air. Number one tried again to stamp its hooves into Excor’s forehead but was parried due to pure luck (Cris rolled a natural 20 parry). Gornix swung his staff at the imp on the ground but missed. Szoo maintained his lock on imp number four. Gornix made another swing with his staff before the fallen imp could leap into the air and bashed its skull. Gornix swung again at number two’s head cracking its dome. Fauna cast lightning bolt at number two but the creature avoided the bolt. Number two leapt into the air and kicked at Gornix but missed. Excor used his spike again at number one adding to its multiple abrasions. Number one failed to cast Pox at Excor. Number four failed to break Szoo’s lock. Szoo, overpowering imp four, swung his staff and slammed imp four into the ground. Gornix swung his staff at number two again but the blow was easily parried. Fauna launched another lightning bolt at imp number two and finally blasted it to bits. Number one kicked at Excor again but missed. Imp number four tried to break the naga’s grapple again but again found itself too weak. Szoo maintained his grip. Gornix used his electrum ring to summon an eagle and sent it to attack number one. It missed. Excor leveled his copper spike at number one again but did no damage. Gornix attempted to perform a coup-de-grace on number four but he only slightly wounded it. As a result of Gornix’s strike it got free of Szoo’s grip. Imp number four jumped up into the air and took wing. Fauna cast a lightning bolt at number four dealing some damage. Szoosha dropped his staff and unsheathed his dagger. Number one tried to kick Excor again and again missed. Gornix cast chrono-missile at number four which it tried and failed to dodge. It was somewhat wounded now. Fauna tried but failed to cast lightning bolt. Szoo tried to stab number four but wound up flinging his dagger about 10 ft. away. Number one again tried and failed to kick Excor in the chops. Gornix’s eagle struck at number one again but its talons were parried. Gornix then pegged number four with some more chrono-missiles. Excor cast Close Wounds on himself. Gornix’s eagle again struck at number one but missed. Gornix let loose another barrage of chrono-missiles at number one finally blasting it from the stormy sky. Fauna cast lightning bolt on number four wounding it. Number four went to kick Gornix in the face and he took the damage and simul-attacked (using his Battle Magic feat) with the chrono-missile spell finally killing it. Excor found Szoo’s lost dagger. All were badly wounded, nearly out of magic and the vitality needed to work it. The mages limped back to Gornix’s apartment as fast as they could. They barricaded the door and secured the window shudders. Gornix cast Close Wounds on himself and Fauna applied healing salve to everyone including herself. They figured they were safe enough to not set a watch, as if they could if they wanted to. Well, after the unintended (I hope) ending of the previous campaign A Giant in Xuun, Cris decided to give another go at GMing since he “had a lot more writing” left over that our characters never even touched on. So, Jenn, Gil, and I wrote up some new “evil” characters for further adventures in the coastal swamp City of Xuun. I decided on a necromancer from the Deadlands from far side of the world of Eu. Also known as Jíen or Xinn, he is a native of the Deadlands born to poor but landed farmers. He took the surname of his step-father (Bozhívostró) whom officially adopted him shortly after marrying his mother not long after Jíen’s birth. His true father’s identity is unknown to him though he is very aware of his adoption. His adoptive father and his mother survive on their poor farm growing herbs & vegetables in the poor soil of the Deadlands. Both are somewhat ineffectual towards Jielínvo favoring instead his two younger brothers, the true heirs of his adoptive father’s property. In a vain effort to please his parents Jíen thrust himself into books and learning diving straight into an academic life even having shown enough promise to be recruited and examined by the provincial temple where he was allowed to study the necromantic arts. A few days after his final exam and as he contemplated a life of civil service, his step-father took him to the docks, tossed him a small coin purse, and pointed out a ship. “That’s your ship”, he said and left the young necromancer to his fate. He had been indentured by his step-father to the ship’s captain as an apprentice Zombie Master. This black vessel, the Silver Owl Mercantile, would be his home for the next 5 years. The silver owl is a fair sized ship with a junk rigging, crimson sails with the white face of an owl painted on the main sail. The ship is equipped to haul trade-goods (mostly noxious alchemical raw materials, slaves, and zombies). It is outfitted to handle a small number of living slaves in the holds and what is called a ‘Bone-Castle’, a chamber in the fore-castle used to store corpses & skeletons. Jíen’s duties included keeping the active and inactive zombie crew well-brined as well as assisting the ship’s Zombie Master in controlling and combating the undead and any unfriendly spirits that may endanger the ship. During his 5 years of contractual service he served mainly as the ship’s Apprentice Zombie Master but was occasionally called upon to take on the duties of a regular crewman whenever the need arose. The ship hauled its cargo to trade under cover of darkness to privately owned Hyvalian ships while in the Solkang Ocean. It also acted as an officially licensed privateer vessel along the Chengorré Coast in the Dread Sound. The ship skirted the Imperial Seas going southeast and harbored in Crescent Moon for a time. From there it sailed back west to such parts as Tower Town and then south to the Mere to act as a slaving vessel. The acquired slave-cargo was then sold off in cities along the Serpent Coast. From the Serpent Coast the ship transported a few strong boxes, guild-marked, to Ezmer along with a couple of mysterious passengers. A failed attack on a smaller Creschan vessel resulted in significant losses among the regular crew, thusly Jíen had to serve out-of-capacity as a sailor during a particularly nasty thunderstorm. As a result Jíen’s right arm got tangled in a rope and tore from the shoulder by the flailing rigging. It was nearly a month before the Master Necromancer could fully repair the damage. The young necromancer’s arm however was lost to the warm waters of the Great Outer Ocean. It was while the ship was ported in Ezmer that Jíen’s contract was up and even though he was offered a standard contract to remain as one of the crew he decided to part ways with the ship disembarking to seek his fortunes in the bustling streets of Ezmer. Here he was able to find various jobs and made a few contacts including knowledge of a powerful slaver named Korvo-Doom, a name he was already familiar with as the Silver Owl often did business with Korvo’s associates in the Screaming Demon Company. When things stagnated in Ezmer and the authorities began to take notice of him he decided to travel further north to Xuun on the first available trade caravan. He also heard of rumors among Ezmer’s mages of a powerful Naga mage known only as “Shadow-Scale” whom may be lurking in the city of Xuun as well as the contact information for another well-connected mage named Korfin. He had hoped that his contacts might provide some kind of employment opportunities fit for one of his talents, if anything he was confident that he could find work in the charnel house. 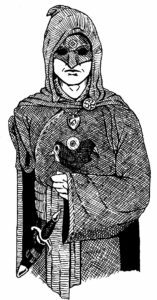 The emblem Jíen wears on the chest of his black robes, puts on his spell books, and uses as his maker’s mark he took from an engraving on a nameless tombstone. It is of an owl & raven back-to-back facing left & right respectively with a lidless eye balanced between them. Over his robes and in addition to a grey waist-sash he wears a high-quality magic rhino-hide belt studded with moonstones and a blue-steel buckle that he had come upon on a lucky trade. He still wears the seaman’s seal-skins over his legs tied above the knee and a dagger with a serrated blade and spiked pommel dangles at his side. On his face he wears a carven leather face-mask fashioned after an owl’s stylized countenance with a lidless eye carved at the center of the forehead. That he wears mainly to disguise the fact that in place of his eyeballs are two pools of lifeless shadow due to his Eldritch Ability of Eyes of the Dead. This ability has its advantages for a necromancer but renders the world at large a misty, grey, lifeless, and lonely place. Following him is his skeletal minion hidden in an identical black robe and a grey cloak and cowl. Not long after arriving in Xuun, Jíen found himself sitting at an ale-soaked table in a smoky dive called the Whiskey-Troll Tavern. The place was over-crowded with gladiators and their managers/owners among them adding overloud business-chatter to the drunken clatter. Across the damp board from the one-armed necromancer sat a couple of rough customers. A short red-haired guy in black studded leather armor with a bronze facemask fashioned after the likeness of a lamb named Trantox, an assassin (played by Jenn) and a bigger guy in bronze armor painted black with a disfigured face named Dravor, a black guard (played by Gil). Both were ruffians from Posionwood. All three dark candlelit and pipe-smoke-limned figures awaited their mutual contact to show while they soaked in the reeking ambience of the place. They were waiting for a bard named Rantcor (former secret contact of the late Cantra). Mentioning the grim reaper conjures up the gruesome image of death, a worm-eaten skeleton cloaked in rot-black and bearing a scythe used to cut-down the living like chaff which manifests personally or through its followers especially in the fantasy realms of role-playing games. Whatever its guise it is inevitably an inescapable force as present in the fictional universe as it is a process in the actual and it is inevitable that Player Characters (PCs) will die on occasion. How should the player, the Game-Master (GM), and the adventurer group as a whole handle it when a Player Character (PC) is cut-down in their prime? 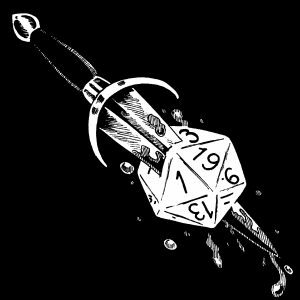 When characters are killed regardless of the cause or where the fault may lie and ignoring such phenomena as DoDs (Dungeons of Death) and Killer GMs, it can have an emotional impact on the player and on the course of the campaign in general. The player’s feeling of loss probably originates from losing something that they have in effect birthed directly from their imaginations and possibly spent quite some time molding, building and adapting. Players in other words tend to specialize in their characters making all transitions to new characters, not just due to death either, fairly difficult. The intimate knowledge the player has of their character has to be let go, partially forgotten in order for them to move on. Such options as building a character of a different race, culture, or character class than their former character can help as well as preventing them from consciously or unconsciously recreating their old character. The player may also feel the emotional impact of sudden loss which is comprised of surprise, disappointment, and what amounts to the sting of ‘losing the game’. Of course as individuals, players will feel any combination of the previous and at varying degrees. Any shame or scorn the group heaps upon them due to their negative reaction or visible disappointment will only magnify these negative feelings and will discourage new players from returning and may give them second thoughts about joining any other gaming groups they may encounter in the future. A sensible amount of sensitivity in these situations is usually called for although if a character dies in a bizarre, stupid, or just plain comedic way, then laughing at it or telling stories about it in good humor are typically not out of line. Criticism of how the player directed their character can wait however allowing for a little time to pass (probably until the next game session) and should come in the form of helpful non-condescending advice. When PCs die it has the most immediate and most emotional impact on the PC’s player but it also can throw a major wrench into the GMs plans and send the campaign head-on into a dead-end or cause it to tailspin into chaos. This occurs when the dead character was involved in at least one important unresolved plotline. Even unimportant plotlines can have a cumulative effect on the campaign if the number of unresolved plots tied to a dead character is numerous. Some of said plots will be simply cut-off essentially being resolved by the character’s death unable to continue but may still leaving behind a feeling of irresolution. This sense of incompletion can be used by the Game-Master to generate some new hooks. This remains true for those threads that are vitally important to the campaign as well. The sense of needing to have an end to these loose-ends is an opening and chance to catch the attentions of the living PCs. In the advent of character death the GM needs to make a quick assessment as to exactly which plotlines have been cut-off and which simply leave the group with a feeling of emptiness and which are necessary to steer the campaign. The GM needs to think of ways to reattach the important threads back to the surviving members if they have not already done so in the course of play up to that point. At the very least, the GM needs alternate lines, back-up plans, to work around the loss or drop clues so as to cause the survivors to seek out the loose threads. The GM, with the player’s permission, can also use this as an opportunity to clue the other PCs in on certain hidden aspects of the dead character letting them get to know the deceased character in an indirect way adding a little more deepness to the game. This all rides on the assumption of course that death is not something that is easy to overcome. In role-playing games and especially those in the fantasy genre, the settings tend to alter the nature of death itself making it in some situations more an inconvenience rather than the ultimate fate of a living being. This is reliant on how death is treated in the setting material, by the GM, and by the player group. Magical resurrection is typically the solution to “bring back” dead characters so any dependent plots are only temporarily stalled taking some of the difficulty from the role of the GM reducing death to a simple narrative device. Of course, there are other implications to this approach both mechanically and sociologically/philosophically in respect to the game world. The effects on the attitudes of the world’s occupants can range from complete indifference to the phenomena of death to outright non-morality when it comes to certain actions such as murder. What does it matter if the victim will be resurrected easily even though there may still be psychological damage to tend with after suffering such a trauma? Mechanically the questions to answer regarding resurrection are its availability, its difficulty, and stipulations (if any). All three points can and should be regulated by the GM but if the GM is using material authored by a third-party such as a purchased setting and/or supplements their hands may be tied, especially if the group objects, the alteration may ‘break’ the setting/world, or the GM has already set an in-game precedent (probably for plot convenience). There are 3 basic mechanical approaches to the nature of death in an RPG: Resurrection, Permanent Death (also referred to as Perma-Death), and No-Death. The thrill of narrowly avoiding death is a great motivator for players and is the primary (and for the GM easiest) source of suspense in dire situations. Precluding death of any kind when regarding the PCs eliminates this and in effect does reduce the fun a bit although it will make all the players feel “safe” foisting more weight onto the shoulders of the GM to set-up the thrills. Another trade-off to this approach is that the GM doesn’t have to worry about random deaths throwing a wrench into their plans. Players should feel that there is risk in the game world concerning their characters. This opens an easy avenue for the GM to create tension. But the GM should stop short of just “knocking one off” just to send a message to their players. Done right death will be a palpable presence in the game whenever the players pick up their dice in a risky situation. Death also opens the possibility of death-defying heroics and the potential for self-sacrifice. Characters can suffer near-death experiences and players can enjoy or suffer the excitement of escaping the slavering jaws of death some may even make it a habit to tempt death whenever they can precluding the need to make an “example” out of anyone. However, this approach can elevate emotions and exacerbate player reaction if a PC bites it at the height of the action. Permanent death may heighten the tension but it in my experience it seems to cause the players to tread a little too lightly especially if they’re attached to their characters they tend to want to err on the side of caution every time bogging the game down and reducing the potential for action immensely. Permanent death should be a shadow hanging over the PCs imaginary heads but there should always be a possibility for reversing the course (often magic or divine intervention become the narrative devices in this mode) though this option shouldn’t be easy or readily available to just anyone for reasons discussed previously. Another aspect of in-game death that can become an issue is its level of apparent randomness. Random death is a real possibility when including death in the game (the dice do fall where they may). Basically this happens when without intending to the GM presents a situation where a PC is killed and the GM had planned otherwise. This is also true of NPCs though a dead NPC is easier to “write out” and find a way around their plotline also the emotional component is much less pronounced as well even if the NPC is well-liked maybe even beloved by the group. The players, without much need for sensitivity can treat NPC-death as a role-playing opportunity. Players should however mind the GM’s pride in such situations. Of course, death shouldn’t appear as too random to the point that players feel it doesn’t matter what they do, they’re just going to die anyway. If the players begin to take that attitude then the GM may have made things a bit too difficult and may need to pull it back a little. The nature of death in TRPGs is largely determined by the participants and secondarily by the published materials that they are using. This is also largely true of what amounts to the afterlife of the deceased character as well. Sometimes a setting, usually fantasy settings, will have a literal afterlife for dead characters to progress into and possibly adventure through (sometimes even while their still living). This essentially creates a no-death situation when viewed at certain angles but generally disengages the sense of loss that should accompany death even if the separation from the in-game living may be there, it usually can be breached if it hasn’t already especially concerning certain RPG character archetypes. By the breaching of the barrier between life and death I do mean the actual ability to communicate with the dead, travel into the dimensions of the dead (the actual afterlife), or otherwise have a factual or working knowledge that there is indeed an afterlife and perhaps even its nature is also known. If the barrier remains intact and even if communication with the afterlife is possible, its nature remains ambiguous then the main question is about what has the dead PC left behind. How is the dead character going to be remembered, what is the in-game legacy that they’ve left, and how long will it remain? Players can treat the death of their characters as the final character development; in essence it is exactly that. It should be determined how they are remembered and how the NPCs that knew them will react such as building a monument, composing a song, the character’s name figuring into a legend or song of the event especially if there are witnesses. Also do not discount the heaping of scorn onto their name if they died foolishly and perhaps a divisive tract authored for manipulative purposes. What is the nature of their commemoration? If the character has relatives or offspring will they carry on the legacy of the dead character? The group as a whole with the GMs guidance should take some time and figure out what the legacy of the dead character is. This ad-hoc eulogy may also help to bring home the loss to the group providing for a somewhat solemn role-playing opp. The legacy of the departed character consists of the lasting opinions of the NPCs that have encountered them or that had relationships with them including relatives and descendants. These opinions and whatever personal anecdotes a character, especially NPCs, carry may only last as long as the character themselves particularly if nothing was recorded or commemorative works composed with respect to the game world. It will also include any leftover material wealth which will definitely come to the attention of their companions probably more immediately than the GM would like. Any dwellings or items and literary works that the character has created or influenced in-game will stand as a testament to their existence within the game-world even leaving a legacy in the form of a uniquely customized item or weapon which can at least carry their name onward if not standing as a reminder of their story/legend. But as with most stories it’s the most sensational bit that will burn its image into the minds of the players, PCs, and NPCs. Probably the most critical part of the deceased’s legacy, the bit that will be the most likely remembered, is how they died. With the inclusion of death as stated before there is the potential for the glorious heroic death and the potential for self-sacrifice. Critically this allows players the opportunities to commit their characters to the Good Death. Players should never be forced or pushed into sacrificing their characters; it should be their choice. The good death is a death that happens on the terms of the character for the most part and from their death the potential for something good and lasting to come of it. This can mean the player chooses to have their character face death with discipline and bravery and eyes wide open or have them fight to the bitter and all too obvious end. The good death is the player’s choice and that which plays to their character either displaying their personality, serving as a redeeming development, or a heroic end. The Good-Death in an odd way contributes to the wholeness of the character. Any way you cut it, it is the end of that character’s personal story but an end with a flourish that will be remembered (if there’s a witness to remember it that is). A good death should carry some kind of meaning as well not just for the character themselves but especially for the player whose character it was. Hopefully this meaning carries over to the group as a whole and at its best will influence the campaign in a positive way. If nothing else it should inspire some interesting war-stories. A good death can help to soften the personal blow that the player feels as well. Of course, if the character dies randomly their death may just be a fact of in-game life. RPG-Death should be reasonably random in nature and be somewhat defeatable under special circumstances. Death in role-playing games doesn’t and in most cases shouldn’t follow the parameters of Perma-Death and definitely not seem to be entirely random. It should serve in its primary capacity to add a definitive element of thrill and risk into the game as well as provide opportunities for the PCs for a Good Death and as the final character development rather than merely the bitter end of a character. Where the players may have to deal with the death of a character in personal terms the GM has to deal with the death of PCs and the sudden deaths of NPCs in primarily mechanical ones. The GM must keep track of their plot-points and the threads which wind and braid throughout their campaign and have backup plans for the important plotlines as well as a finely-honed talent for quickly and neatly tying together severed plotlines when necessary especially when confronted with a sudden and unexpected character death. The GM should also keep in mind the mechanical capacities of the PCs so as not to have to experience the unintentional extermination of the entire adventuring group in what is known as the Total Party Kill (TPK) phenomena. There is no recovering a game from a TPK as everyone is probably going to have to generate new characters that will probably not have any meaningful connections with the previous characters at all though it is possible to generate PCs that are related in various ways to the former not to mention the use of apprentices, protégés, and squires. These may pick-up any dangling threads left over by their predecessors but will definitely not be able to pick back up every single one to reboot the previous campaign. Also GMs shouldn’t use character death to punish players or as an excuse to penalize them though there should be consequences (which can invest the players in their current or new characters even more if handled correctly). Basically, don’t intentionally try to kill PCs especially since sometimes Random Death can still rear its ugly head when you least expect it. Death like most other components of TRPGs is an opportunity to deepen the game and add to the experience of all of the participants. It is a component which contains thrills, risk, and strong emotions in strange and varying amounts and which leaves an indelible mark on the memory. It is a very heavy subject even where concerning RPGs and is almost a living part of them as sometimes it can be just as unpredictable and out of the GMs hands as in real-life but the nature of which can be altered and borders regulated to maximize enjoyment and make the most of the game.